You may remember back in the fall when in two different Craigslist deals I acquired about 40,000 cards for about $100 total. It has taken me months but now I am at the point where all of the cards are sorted and organized, and split into cards I needed and cards for trade. Of the lot I got there are about 25,000 cards to trade. I have a pretty standard (albeit detailed) process I go through whenever I get new cards. First, sort the cards into order by set and year. Then, go through my Beckett Almanac (a few years out of date now) which I use as a master checklist to figure out which cards I need. Then I update my tradelist and my wantlist. After that, I have a spreadsheet of cards by player that I update, and then finally I integrate the for-trade cards into the trade boxes and the keepers into my main collection, both of which as sorted by set and year. With 25,000 cards to trade, I don’t really want to have to add that many cards to the wantlist, and to integrate that many cards into trade boxes. Much more fun to do work with the cards I’m keeping. Besides, the point of getting duplicates is to trade them, not catalog and save them. So, I’d like to trade as many of these cards as possible at this stage, before I update the tradelist. Therefore, I am instituting Bo's Mega Trade-a-Thon. What I have done is compile a detailed list of cards I have for trade so people can let me know what they are interested in. I know back in September several of you [see below] expressed interest in certain cards, so they will get what they asked for (assuming they are still interested). However, I would ask people who are interested in cards from a team to let me know if there are certain years/sets they are or are not interested in. Otherwise I will give (one of) every card from that team. There are multiples of many cards so I can definitely accommodate multiple requests for a team, first come first served. As you will see there is not much junk wax, most of this is in the 93-98 era, but a lot of people might not want 1991 Score or 1992 Donruss. There are a few 1993 sets that there are a TON of cards from – Pinnacle, Score, Stadium Club and particularly Upper Deck. 1996 Topps too. I hope I can get some takers for those. Also there is a lot of football, basketball and hockey that I would love to trade for some baseball cards. However, I hope I get more than just team requests! I know the blogosphere is dominated by team bloggers, and I have to admit it kind of annoys me when people automatically earmark their dupes by team. I know it’s easier but non-team-specific collectors like me probably miss out on a lot. If you have interest in certain sets, players, mini-collections, whatever, bring it on! I will prioritize these type of requests over team requests (i.e. if one person needs a card because it fills a set need and another because it is their favorite need, it will go to the set need), but am more than happy to fill team requests as well. 25,000 cards divided by 30 teams equals over 800 cards per team, plenty to go around. What I plan to do is wait (while updating my currently a-bit-out-of-date want list) for all requests to come in, then do one pass-through of all the dupes and sort by who is getting what. I am moving (the third and last time in the last twelve months) and my new house will have a room that I can dedicate to my ever-expanding collection (and lock so my three-year-old can’t destroy it). Once I am settled after the move I will have everyone’s request and start sorting all those dupes into (hopefully) a whole bunch of trade piles. As for what I would like in return, my written wantlist just scratches the surface of what I am looking for. I love oddballs, minor league cards, or really anything else that I don’t already have. I’m an omnivorous collector so I’m pretty easy to please. If anything I enjoy a trade package full of random, unexpected stuff even more than a bunch of hits off my wantlist. Plus if everyone goes for my wantlist I’ll probably get a lot of the same cards from multiple people. (My wantlist also includes my list of already-completed sets). Basically, as long as you have plenty of cards to trade from the post-1993 era (or oddballs from the 1977-1993 era) you will be able to make me happy. Also a wide array of non-sports and non-card stuff. I have seven cards of Terry Bradshaw. This one is from 1996 Collector's Choice. Playing career: Outfielder Terry Bradshaw played in 34 games for the Cardinals in 1995 and 1996. He hit .262 with 0 HR and 5 RBI. Where he is now: Minor league hitting coordinator for the Kansas City Royals. Interesting stories: When Dmitri Young was posing for his 1993 Upper Deck card, he “was trying to look hard instead of smiling”. However, Bradshaw and Keith Jones were making jokes causing him to laugh, and his picture shows Young with a big smile. He refuses to sign that card today. 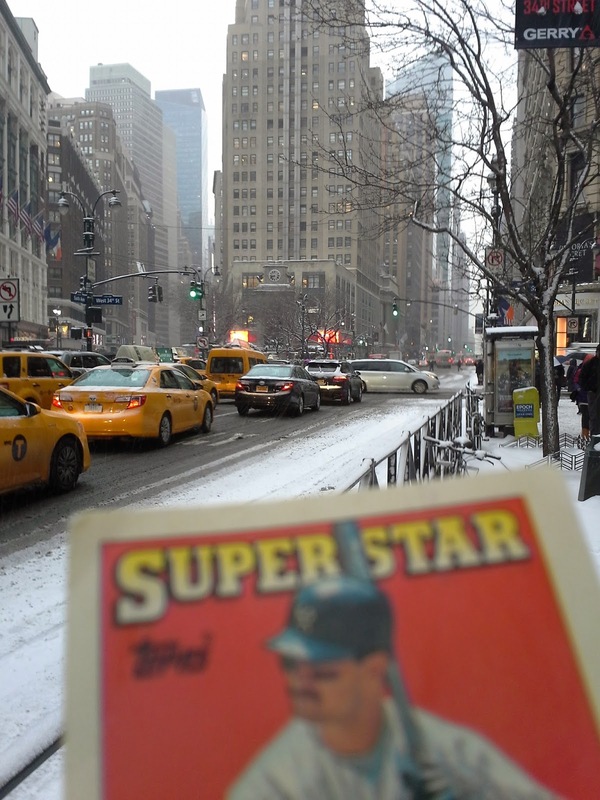 My memories: I remember being surprised to see a baseball player having the not-very-common name of a football star. Google Autocomplete results: He is first when you type Terr, ahead of Terry Crews, a former NFL player who later was an actor in movies like Starsky & Hutch, Get Smart and the Expendables trilogy. There are no references to the baseball player in the first page of Google results; all refer to the NFL star. Coming up next: The next profile will be Brian Brady. A.S. Beck was a chain of shoe stores that proliferated in Manhattan from the 1930s to the 1970s. 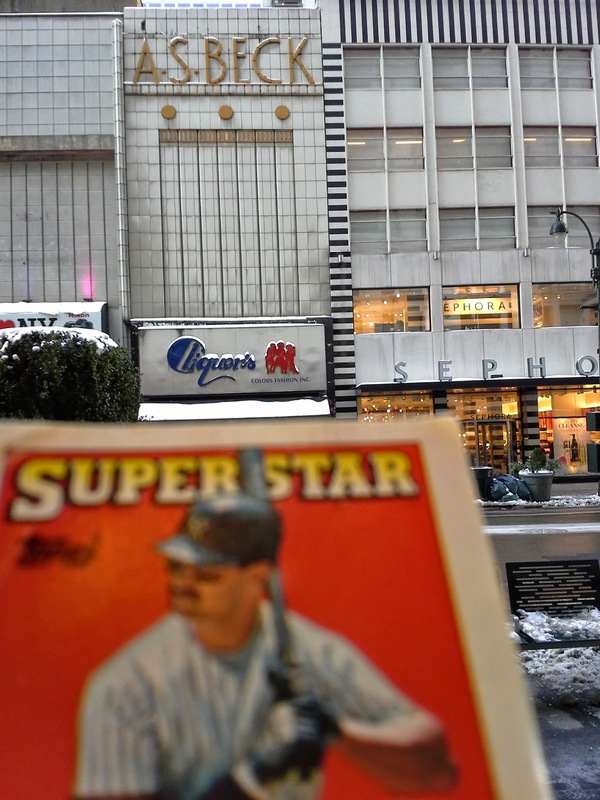 Their last location, on 34th Street across from Macy's, closed in 1982. However none of the subsequent stores, including the current "Cliquer's", have removed the great old art deco sign. I have one card of Kevin Bradshaw, from 1990 ProCards. 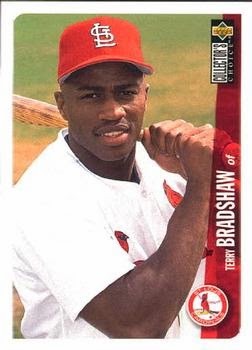 Playing career: Infielder Kevin Bradshaw played in the Tigers organization from 1986 to 1989. In 282 games he hit .241 with 0 HR, 65 RBI and 16 SB. 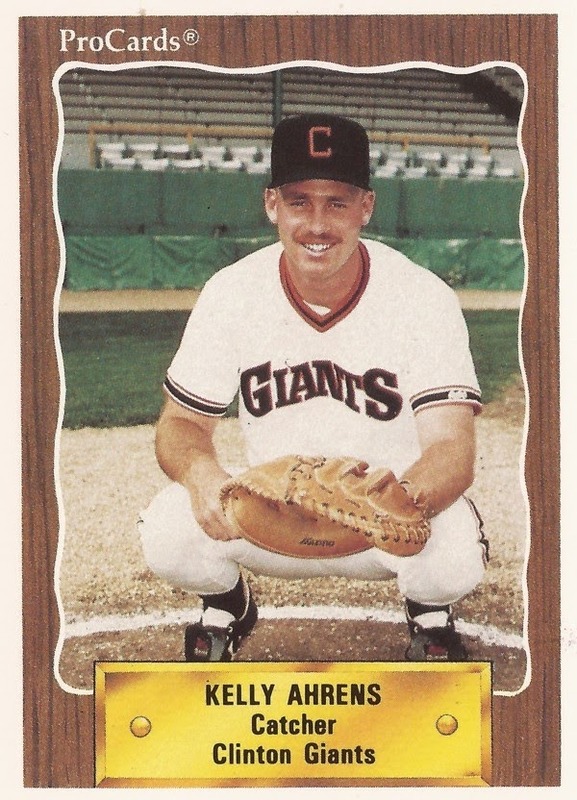 Where he is now: Minor league infield coordinator for the Orioles. Google Autocomplete results: He is first when you type Kevin Brads, ahead of Kevin Bradshaw Linkedin, referring to 114 people on the social media site. There are no mentions of the baseball player on the first page of google results; most are about a former college basketball star. Coming up next: The next profile will be Terry Bradshaw. Toynbee Tiles are an interesting urban mystery. No one knows who has imprinted these messages on the streets of various US cities, with their brief, cryptic messages - "Toynbee Idea - Movie 2001 - Resurrect Dead - Planet Jupiter". Wikipedia gives a pretty good overview of the theories behind these mysterious tiles which have been found on roads in the northeastern US since the late 1980s. Though most of the tiles are in Philadelphia and nearby cities, they have been found as far as Boston to the north, Washington to the south and Kansas City to the west. Check out this map to see if there are any in your city, and where exactly they are. 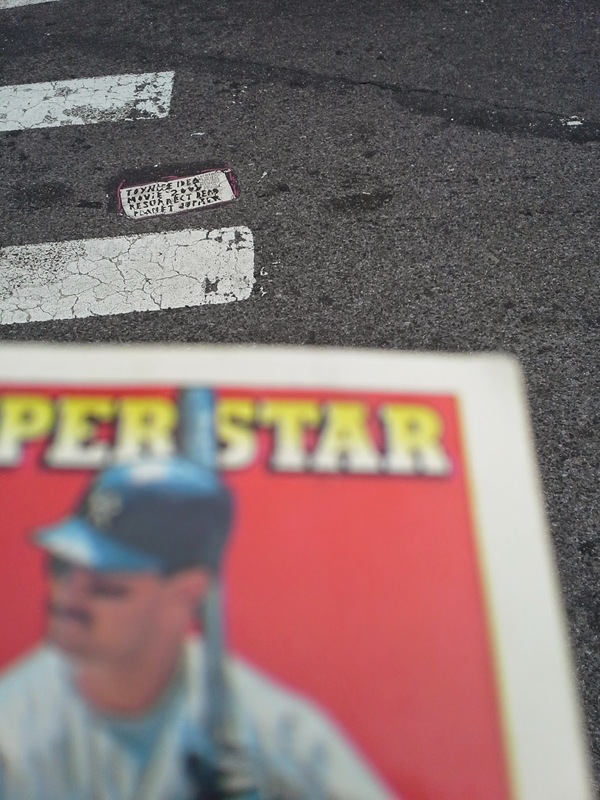 Here's Donnie Wallet Card checking out the Toynbee tile at 35th Street and Broadway. I have 39 cards of Scott Bradley. This one is from 1986 Donruss. 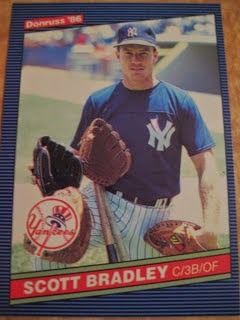 Playing career: Catcher Scott Bradley played for the Yankees, White Sox, Mariners and Reds from 1984 to 1992. In 604 games, the backup backstop hit .257 with 18 HR and 184 RBI. He caught Randy Johnson’s first no-hitter in 1990. Where he is now: He has been the head baseball coach at Princeton University for the past seventeen seasons. Interesting facts: His brother Bob Bradley was the head coach for the US men’s soccer team in the 2010 World Cup. My memories: I remember him being part of one of the many Yankee-White Sox trades of the mid-1980s. Google Autocomplete results: He is fifth when you type Scott Bra, between Scott Braunstein, a money manager at hedge fund Point72, and Scott Bradlee Youtube, referring to pop music videos. The first entry when you google Scott Bradley is not the ballplayer but the composer for the classic MGM cartoons. Coming up next: The next profile will be Kevin Bradshaw. Outfielder Philip Cerreto played in the Cardinals organization in 2010 and 2011. In 66 games he hit .304 with 7 HR and 51 RBI. Now a student at the Virginia Commonwealth University School of Pharmacy, he kindly answered my questions about baseball cards. "I guess the one thing that's kinda funny is my mom owns a business and everyone kept giving her my baseball card that came in to see her. Now we have thousands of my Topps card (which is my favorite) in every different edition and all types of chrome. I used to be a big baseball card collector when I was younger but stopped because of school work, work in general, and just a lack of money." "We are creating our own line of "Amateur" cards. We will have a spring season, fall season and a "Special Edition" each year. This will give our players 3 cards in a year to collect. I anticipate many of these guys will play professional baseball one day and the value of these could be worth while. Creating this "Amateur" market is going to be big and I need an expert to assist/manage. Basically the "Pin Trading" that goes on across the country will be replaced by "Card" trading, they can autograph and exchange. I will have my own private label but assist in growing the market for other brands/teams as well." I wonder if any of you readers have an interest in helping him out? 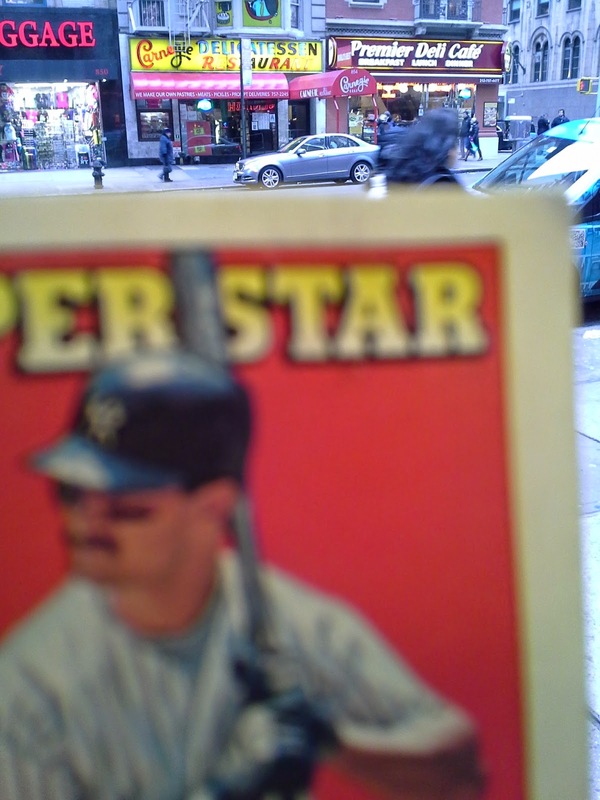 Maybe someone with trading card or general business experience and wants to get into a baseball card-related venture? Infielder Luis Sojo played thirteen years in the major leagues, seven of them with the Yankees. In three World Series with the Yankees he hit .400, and he is best known for his ninth-inning, go-ahead hit off of Al Leiter to win the final game of the 2000 World Series. 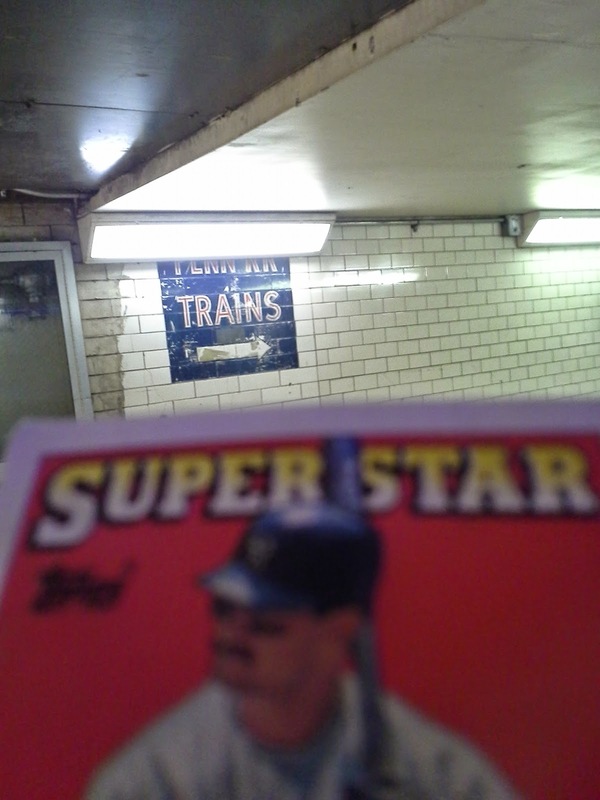 Most recently a minor league coach for the Yankees, he kindly (if briefly) answered my questions about baseball cards. "I have lots of cards but I have no favorite!!" Horn & Hardart Automats were once ubiquitous in the city. From the 1920s to the 1960s these places were very popular. These automats had little glass containers on the walls with foods. You would put your coin in a slot and that would open up the glass container and get your food. Eventually the rise of fast food killed the automats. (In fact, the McDonalds you see in my last Wallet Card photo is actually the former location of an automat). I remember eating at one when I was a kid, it was kind of fun. The last Horn & Hardart automat, on 42nd and 3rd, closed in 1991. The location at 7th and 38th most have closed many years earlier, but their sign is still clearly visible above a parking garage. I have three cards of Ryan Bradley. This one is from 1998 Fleer Tradition Update. Playing career: Ryan Bradley was the Yankees’ #1 draft pick in 1997 and went on the fast track to the majors. In the minor leagues in 1997 and 1998 he went 12-6 with a 2.44 ERA, walking 56 and striking out 191. 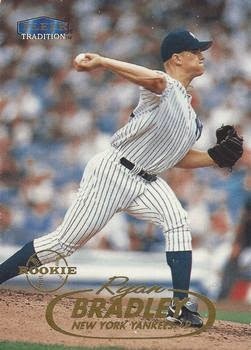 In a call-up to the Yankees late in 1998 Bradley went 2-1 with a 5.54 ERA, walking 9 and striking out 13. His confidence must have been shaken because he completely lost his control and was never the same pitcher again. 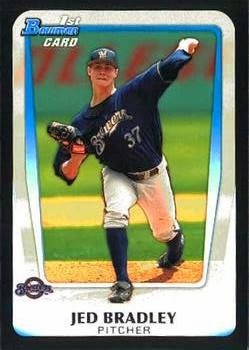 In the minor leagues from 1999 to 2002, he went 18-23 with a 6.01 ERA. My memories: I remembered him as a highly talented prospect and wondered why I never heard about him after his brief big league appearance. Where he is now: A Risk Manager at Wells Fargo Insurance Services. Google Autocomplete results: He is eighth when you type Ryan Bra, between Ryan Branski, an Associate Director at NYU Voice Center, and Ryan Brandau, Artistic Director at Princeton Pro Musica. The first entry when you google Ryan Bradley is not the ballplayer but a figure skater. Coming up next: The next profile will be Scott Bradley. One of the coolest thing about old buildings are the vintage ads painted on the sides - they are almost always many decades out of date, making them a nice little time capsule. This one on West 36th street, near 6th Avenue, always makes me laugh because of the name all the way at the top - Style Undies (you can see it if you "view image" and then zoom in). Thanks to the great site 14 to 42 I learned that Style Undies was the name of a children's underwear manufacturer that was in that building from 1938 to 1957, when they relocated two blocks south. They went out of business in 1973. The site also gives details on the six other companies who have ads on the side of the building. All have been out of business for decades and none have been in this particular building since 1967. I have 53 cards of Phil Bradley. 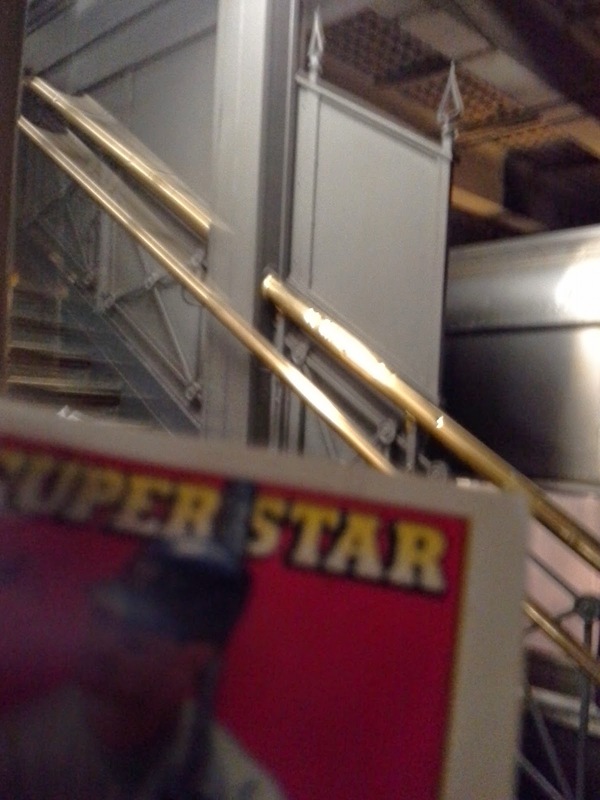 This one is from 1986 Topps All Star Collector's Edition. 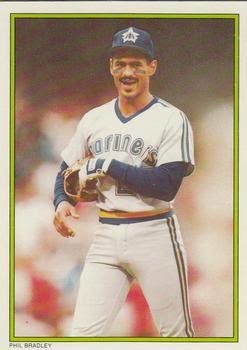 Playing career: In his 1984 rookie season, Mariners outfielder Phil Bradley hit .301 with 0 HR and 24 RBI in 124 games. The next year, he hit .300 with 26 HR and 88 RBI in 159 games. Fans probably would have been chanting “steroids” if this happened today. Though he didn’t regain his 1985 form again, he was an excellent hitter for several seasons. Overall, in 1,022 major league games he hit .286 with 78 HR, 376 RBI and 155 SB. 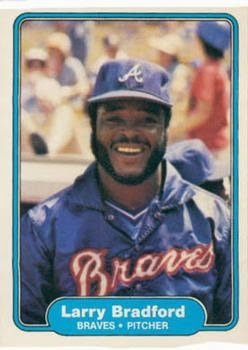 A fuller account of his career can be found at the 1986 Topps blog. Where he is now: A special assistant for the MLBPA, Bradley visits teams throughout the season to address players’ union needs. My memories: I remember him as one of the few stars on some bad Mariner teams. Google Autocomplete results: He is eighth when you type Phil Br, between Phil Bredesen, former governor of Tennessee, and Phil Bruno, a Principal at McKinsey. Another prominent Phil Bradley is an information specialist. Coming up next: The next profile will be Ryan Bradley. James Gordon Bennett Sr. was publisher of the New York Herald, one of the city's most nativist, racist and anti-Semitic newspapers in the nineteenth century. He was also obsessed with owls. Some say the sound of a hooting owl saved his life when getting lost while sailing in the dark. Others claim it was the symbol of a secret order like the Illuminati. 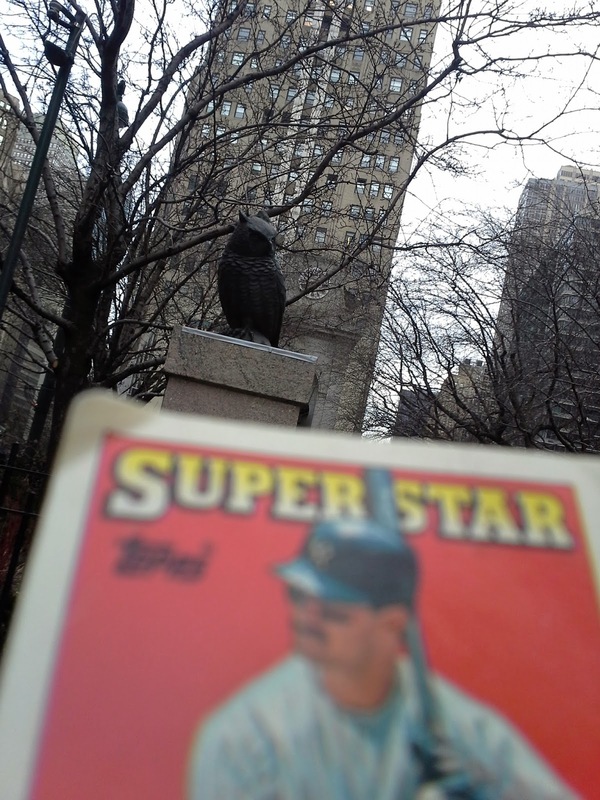 There are a bunch of owl statues in Herald Square. As promised a few days ago, here's a picture of Donnie with one of the owls. As you can see the card is already starting to get beat up from going in and out of the wallet. My favorite Herald Square owl is easy to miss - it is stamped on a maintenance door on the back of the large statue of Minerva (a Greek goddess associated with the owl). 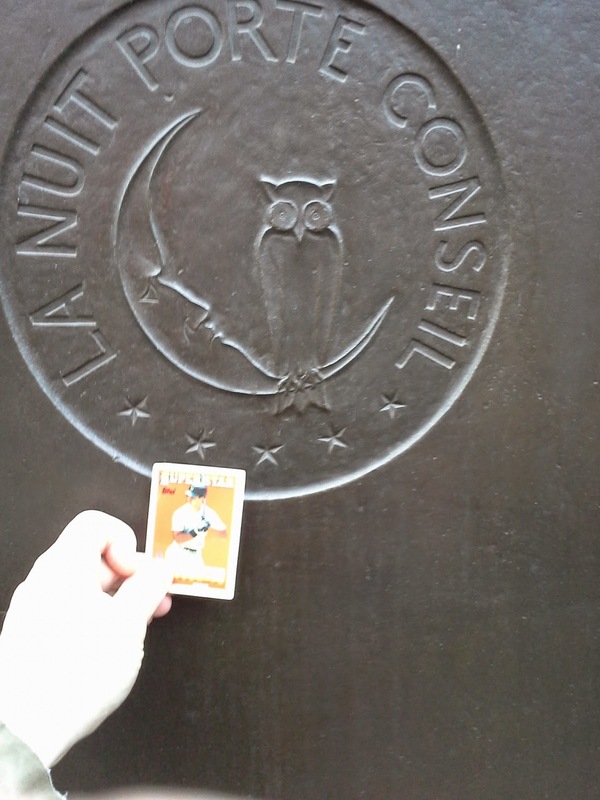 Bennett's personal motto is featured on the emblem - the French expression "La Nuit Porte Conseil", which means to "Sleep on It" (literally "The Night Gives Counsel"). The five stars and the moon with the owl, some say, are indicators of Bennett's secret society. I have 23 cards of Milton Bradley. This one is from 2000 Bowman. 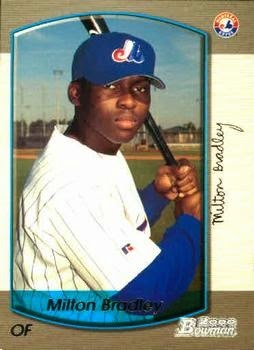 Playing career: Outfielder Milton Bradley played in twelve seasons and over 1,000 major league games for eight different teams. A lifetime .271 hitter with 125 career home runs, his best season was 2008, when he made the All-Star team with Texas, hitting .321 with 22 HR and 77 RBI, leading the AL with a .436 OBP, .999 OPS and 162 OPS+. Where he is now: In 2013 Bradley was sentenced to 2-1/2 years in jail for multiple instances of domestic abuse. He is currently free while the case is on appeal. My memories: I remember him as a notorious hothead, such a strange juxtaposition for a name that is so synonymous with innocent childhood fun. Google Autocomplete results: He is eighth when you type Milton , between Milton Keynes, a town in England, and Milton Bradley Game Designer, the board game pioneer. Coming up next: The next profile will be Phil Bradley. I have two cards of Mark Bradley. This one is from 1984 Fleer. 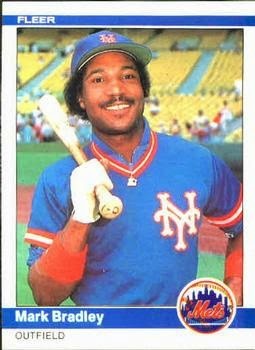 Playing career: Outfielder Mark Bradley played for the Dodgers in 1981 and 1982 and the Mets in 1983. In 90 games he hit .204 with 3 HR and 5 RBI. Where he is now: According to Ultimate Mets Database, he has kept a very low profile in his post-playing career, making him a tough autograph to acquire, but one collector tracked him down at a KFC where Bradley was working as of 2003. Google Autocomplete results: He is sixth when you type Mark Brad, between Mark Bradley Miller, a photographer, and Mark Brady Gallery, an art gallery. There are no references to the baseball player on the first page of Google results; the first entry is a former Bears wide receiver. Coming up next: The next profile will be Milton Bradley. The Hilton Passageway (the name came when the Hotel Pennsylvania was still called the Statler Hilton) runs more or less below 32nd street, between the LIRR and the Amtrak/NJ Transit tracks. This oft-forgotten corridor has some of the best glimpses of the old Penn Station. This sign by the 2 and 3 subway entrance points you to Penn R.R. Trains. Not technically pre-renovation, but right after, as the Penn Central Railroad went bankrupt in 1970. This sign was out-of-date before Donnie Baseball was even Donnie Fifth Grade. Moving east along the corridor there is some exposed tile where the drop ceiling has been removed. These glass bricks used to filter sunlight down through the old Penn Station. I have one card of London Bradley, from 1993 Classic Best. Playing career: Third baseman London Bradley played in the Cubs organization from 1992 to 1994. In 102 games he hit .276 with 2 HR and 39 RBI. Where he is now: Sales Leader, West Central Region at Allstate. Google Autocomplete results: He is tenth when you type London Bra, behind London Brand Jeans, a pants manufacturer. The first entry when you google London Bradley is not the baseball player but a 21-year-old who died after a seizure playing basketball last year in Florida. Coming up next: The next profile will be Mark Bradley. 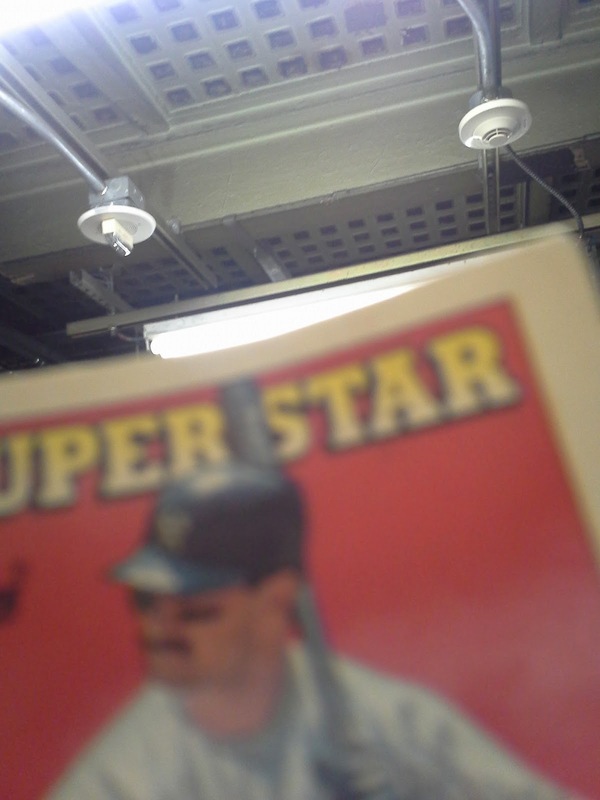 Here are a couple of cool of cool anachronisms that you can find on Track 17 at Penn Station. I had read about this really cool anachronism a while ago. The arrowheads on the stairwell are just about the last remnants of the old Penn Station before it was demolished in the 1960s. The article mentioned a couple of other remnants that may still be visible, will try to take Donnie there this week. I have one card of Jed Bradley, from 2011 Bowman Draft Picks & Prospects. Playing career: Jed Bradley was the Brewers’ first round pick in 2011. He has gotten off to a slow start, struggling to get out of Class A Brevard County, where he went 9-14 with a 4.95 ERA in 2012 and 2013. Where he is now: In 2014 he finally conquered Brevard County, going 5-2 with a 3.00 ERA in ten starts. Promoted to AA Huntsville, he went 5-8 with a 4.55 ERA in seventeen starts. Google Autocomplete results: He is third when you type Jed Br, between Jed Brickner, an employee benefits law partner at Latham & Watkins in New York, and Jed Brettschneider, who recently plead guilty to health insurance fraud in Massachusetts. Another prominent Jed Bradley is a Vice President at Credit Suisse in New York. Coming up next: The next profile will be London Bradley. Between several life events, both good and bad (including closing on a house - will have a permanent mailing address soon! ), I haven't had a chance to even look for places to post wallet cards yet. Today I was going to but with all of this snow it's been hard to get around. So here are some pictures of part of my morning walk to work in today's snow. 34th & Broadway Facing north: Herald Square. When the weather is nicer I'll take Donnie inside to see the owls. 34th & Broadway facing south: Greeley Square. I have seven cards of Bobby Bradley. This one is from 2001 Stadium Club. 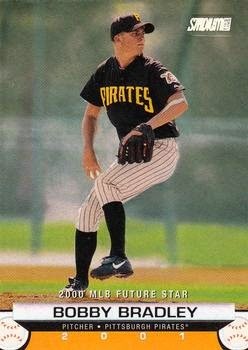 Playing career: Bobby Bradley was the Pirates’ #1 draft pick in 1999, but his career was marred by injuries, and he only pitched in 74 minor league games. He mostly pitched well in those appearances, going 18-12 with a 3.25 ERA. A fuller account of his career can be found at Pirates Treasure Room. Where he is now: He has gone on to success in another sport – golf. A 7-time REMAX World Long Drive Finalist and a member of the 2013 Callaway XHot Long Drive Team, he owns Charity Golf International, a long drive entertainment company that has generated over $1.25 million for various charities. Google Autocomplete results: He is fifth when you type Bobby Bra, between Bobby Brackins Wiki, referring to a rapper, and Bobby Braddock, a country music writer. The first entry when you google Bobby Bradley is not the Pirates’ former #1 pick but the #1 pick for the Indians in the 2014 draft. Coming up next: The next profile will be Jed Bradley. 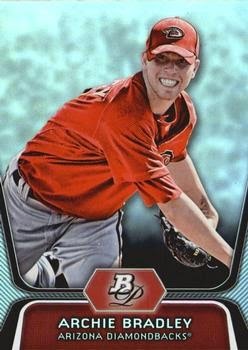 I have one card of Archie Bradley, from 2012 Bowman Platinum Prospects. Playing career: Archie Bradley was the Diamondbacks’ #1 draft pick in 2011, and pitched very well in A ball in 2012 (12-6, 3.84) and even better at AA in 2013 (12-5, 1.98). Where he is now: Suffered through an injury-plagued 2014 at AA Mobile (2-3, 4.09) and AAA Reno (1-4, 5.25). Expected to start 2015 in AAA. Google Autocomplete results: He is third when you type Archie B, between Archie Bunker’s Place and Archie Bunker Quotes, referring to the famous TV bigot. There do not appear to be any other prominent Archie Bradleys. Coming up next: The next profile will be Bobby Bradley. 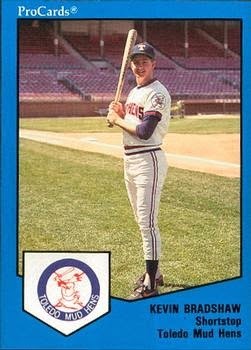 I have one card of Mike Bradish, from 1990 Utica Blue Sox. 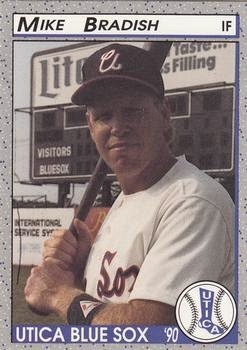 Playing career: First baseman Mike Bradish played in the White Sox organization from 1990 to 1994. In 152 games, all in A ball, he hit .252 with 2 HR and 56 RBI. Where he is now: Anyone know where Mike Bradish is now? Google Autocomplete results: He is first when you type Mike Bradi, ahead of Mike Bradecich, an actor. The first entry when you google Mike Bradish is not the ballplayer but the CFO of Florida East Coast Industries. Coming up next: The next profile will be Archie Bradley. I have seven cards of Larry Bradford. This one is from 1982 Fleer. Playing career: Larry Bradford pitched for the Braves from 1977 to 1981. In 104 games, all in relief, he went 6-4 with 7 saves and a 2.52 ERA. Death: He died of a heart attack while watching a Braves game at Turner Field on September 11, 1998. Google Autocomplete results: He is fifth when you type Larry Brad, between Larry Brady, Internship Instructor at SUNY Cortland, and Larry Bradby, a photographer. The first entry when you google Larry Bradford is not the ballplayer but a CPA in Texas. Coming up next: The next profile will be Mike Bradish. 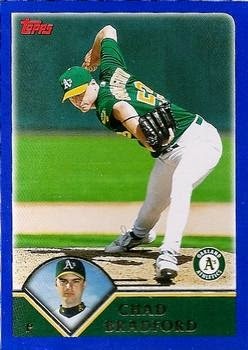 I have five cards of Chad Bradford. 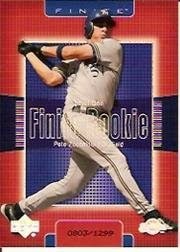 This one is from 2003 Topps. Playing career: Chad Bradford was one of the more prominent middle relievers of the 2000’s. In 561 games he went 36-28 with 11 saves and a 3.26 ERA. He pitched in the postseason for five different teams (White Sox, A’s, Red Sox, Mets and Rays) between 2000 and 2008, allowing just one earned run in 23.1 innings. He was a prominent figure in the Moneyball book and movie. Where he is now: An assistant coach at Hinds Community College in Mississippi. My memories: I remember him before the Moneyball hoopla being known as the pitcher with the most extreme submarine motion in the majors – you would see a lot of pictures of him with his knuckles almost scraping the mound as he delivered. Google Autocomplete results: He is first when you type Chad B, ahead of Chad Brown, a poker player. Coming up next: The next profile will be Larry Bradford. I have been thinking for a while about a new inspiration for this blog. While I enjoy doing the daily player profiles I get the feeling it might be getting stale for some readers and I was wondering what to do mix in. 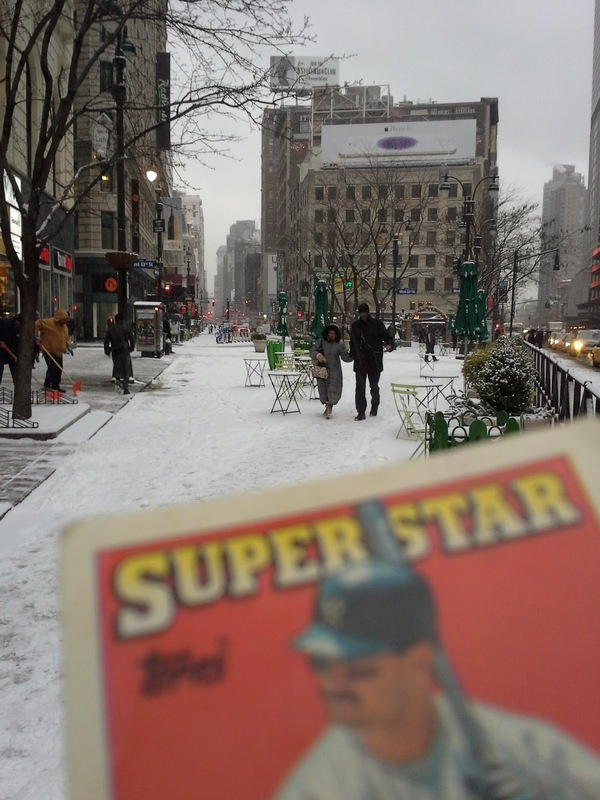 Then today I read Gavin's Game of Wallet Card idea from his terrific blog Baseball Card Breakdown. That gave me a great idea. Another area I am becoming interested in is the many things to see and do in midtown. Manhattan where I work. 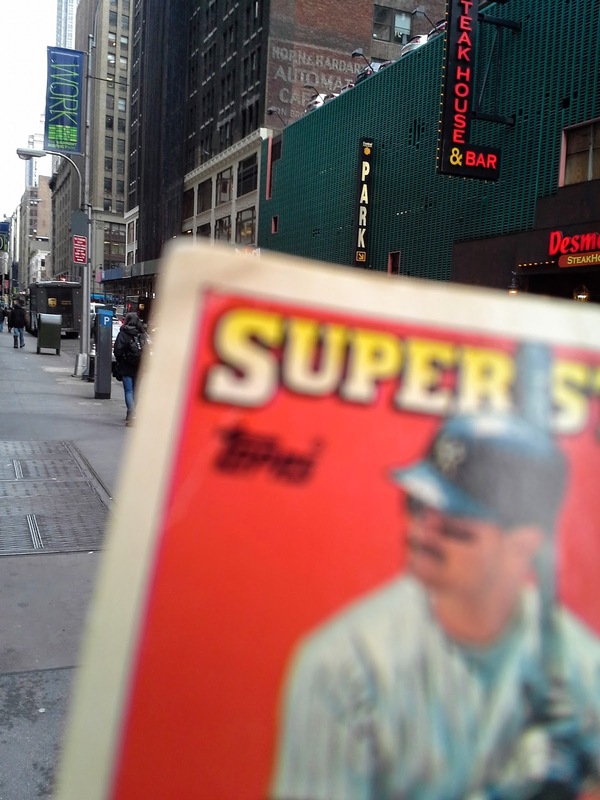 I have become a big fan of blogs like Scouting New York and Facebook groups like NYC 1950 to Present. Lately I've been taking a lot of walks around the area where I work, and there are so many interesting things that would be just perfect for this project. 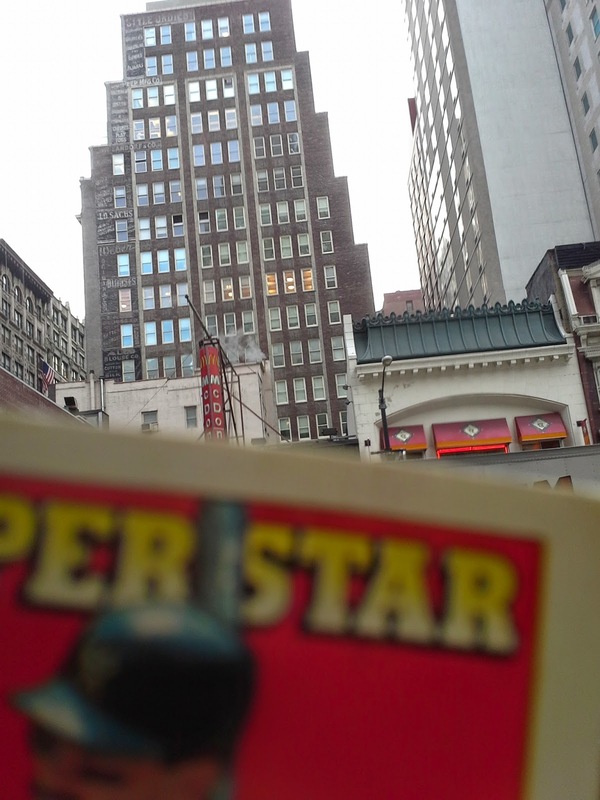 I would avoid super-touristy attractions like Times Square or the Empire State Building but there are so many cool things that would be fun to share, and the wallet card project would be the perfect way to do it. I am thinking that I will post pictures of the wallet card in some interesting place and post at least once a week, and maybe more, with a short description of why I chose that particular location. I've already got a ton of ideas. But which card should I pick - that was a hard decision! I didn't want to do a full-size card because it would be mangled instantly in my wallet. I know some bloggers are interested to see what happens to a card over time, but my collection is not condition sensitive and I've got a ton of beat-up cards already. However, I don't have many minis. Looking at some of my mini cards, I had the inspiration to use the 1988 Topps Sticker Backs. I actually collected stickers before I switched to cards as a kid. When Topps switched from paper sticker backs to little "baseball cards" on the back, I was very excited. A sticker (or two) and a card all in one! It's actually the first baseball card set I ever completed. 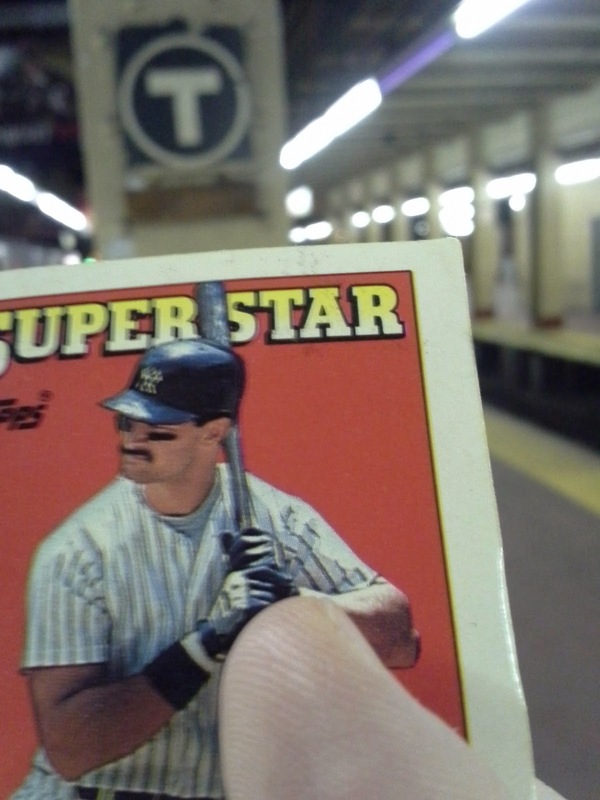 And there was no better choice for this Yankee fan as to who should represent the set in my wallet than Donnie Baseball himself, Don Mattingly. Readers, let me know if you do not want to see too much of this card throughout the year, as I might easily do 50 or 100 of these. If, on the other hand, you like the idea and have any specific requests of places in midtown Manhattan you'd like to see him end up, I'd love to hear them. I may occasionally do a Long Island picture, and I'll definitely do Yankee Stadium when I go to a game, but this will be very Manhattan-centric. Hope you enjoy it. I have four cards of Dallas Braden. This one is from 2007 Topps Updates and Highlights. 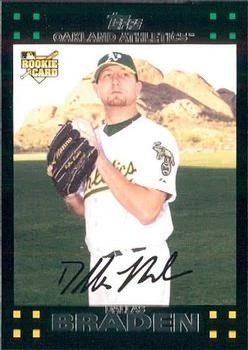 Playing career: Remember Dallas Braden? He was a young, undistinguished pitcher for the A’s who picked a fight with A-Rod in 2010 and then threw a perfect game a few weeks later. After that season he injured his shoulder and only pitched in three more major league games. My memories: I remember him going out of his way to get in an argument with A-Rod. It seemed like a little guy trying to prove himself by going after the biggest guy around. When he pitched the perfect game, he again did a lot of yapping to the media, and I was thinking that I was going to have to hear about this self-promotional guy for the next ten years. I was glad there ended up being a few more perfect games that year to dilute his, and while the injury is unfortunate, he probably would have been one of the most annoying guys in the league. Where he is now: A studio analyst for ESPN. Sounds about right for him. Google Autocomplete results: He is sixth when you type Dallas B, between Dallas BBQ Flatbush, a restaurant in Brooklyn, and Dallas Baptist University, a school in Texas. There do not appear to be any other prominent Dallas Bradens. Coming up next: The next profile will be Chad Bradford. I have two cards of Miah Bradbury. This one is from 1991 Classic Best. 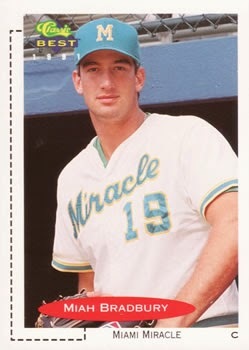 Playing career: Catcher Miah Bradbury played two seasons for the Miami Miracle, one of the first modern independent minor league teams, then played for the Mariners’ Class-A team in 1992 and was then traded to the Expos for the 1993 season. He quit due to low playing time, only getting in nine games by July 4 despite hitting .312 in those games. Where he is now: Regional Internet Director at Group 1 Automotive in Anaheim. Google Autocomplete results: He is eighth when you type Miah B, between Miah B, an artist on DeviantArt, and Miah Boden, Undergraduate Admissions Counselor at Bellevue University. Coming up next: The next profile will be Dallas Braden.